I’m looking forward to teaching a series of “Spring Tune Up” Kundalini Yoga classes at Yoga West again this year! Read on for a summary of the series and details on the dates and location. You’re very welcome to attend, even if you’re brand new to Kundalini Yoga (or yoga in general). Toxins are a part of everyday life. Even your own body create toxins as part of the normal digestive process. To lighten your load, it’s a good idea to take steps to reduce the amount of toxins you’re exposed to — for example, by eating healthy, organic food and drinking clean, filtered water. It’s equally important to tune up your body’s toxic removal systems so that you’re well equipped to deal with toxicity that inevitably shows up in your life. The March 4 class will provide an overview of our innate ability to detoxify, and we’ll explore how Kundalini Yoga can help. 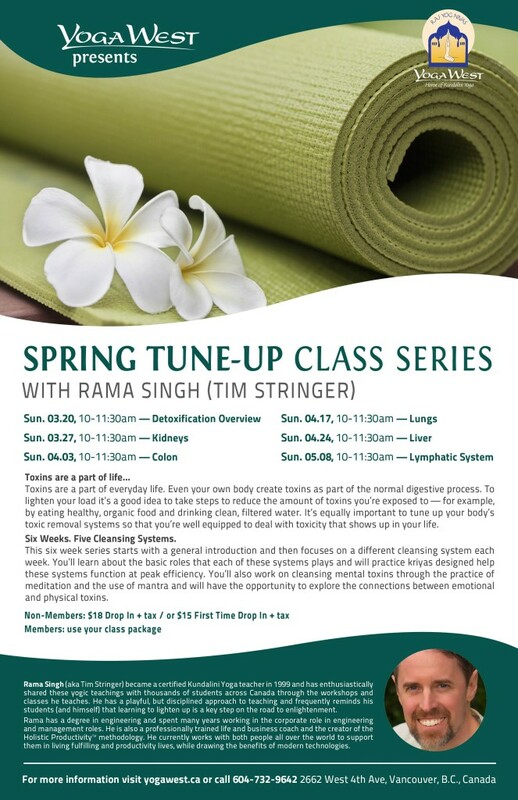 Each of the following Sunday (10-11:30am) classes will focus on a specific cleansing system. You’ll learn about the basic roles that each of these systems plays and will practice Kundalini Yoga kriyas (yoga sets) designed help these systems function at peak efficiency. You’ll also work on cleansing mental toxins through the practice of meditation and the use of mantra. And we’ll explore the link between emotional and physical toxins. All classes are at Yoga West (2662 West 4th Avenue, Vancouver) on Sundays from 10-11:30am (specific dates are below). You’re welcome to attend as few or as many classes as you like and beginners are welcome. Use your Yoga West class package or pay for a drop-in class ($15 for your first class, $18 otherwise). Please arrive by 9:50am if it’s your first class at Yoga West. I’ll be teaching four “Kundalini Yoga Foundations” classes over the next couple of months. All classes will be held on Sundays (January 7, 21 & 28 + February 25) from 10-11:30am at Yoga West, located at 2662 West 4th Avenue in Vancouver. These classes are perfect if you’re practicing Kundalini Yoga for the very first time or want to brush up on the basics. Kundalini Yoga is a holistic practice that acknowledges that we humans are multi-faceted by nature and that all of these facets are intimately connected. Each class will focus on one aspect of this practice, always in the context of this holistic model. Class 1 (January 7, 2018): The Power of the Breath (Pranayama) — Most of us were never taught to breathe growing up…and likely aren’t breathing as effectively as we could be. During the class we’ll explore a variety of breathing, or pranayama techniques that help us tap into our inner calm as well as some to energize and cleanse the body. Class 2 (January 21, 2018): Nerves of Steel (Nervous System) — Yogi Bhajan put a lot of emphasis on the nervous system and gave us a wealth of techniques to help us build this system so that we’re better equipped to handle the stresses of life. I’ll be taking you through some of these techniques during the class and talking about some things you can do in your day-to-day life to help maintain a strong nervous system. Class 3 (January 28, 2018): Your Guardians of Health (Endocrine System) — Yogi Bhajan also talked a lot about the endocrine system and collectively referred to these glands as our “guardians of health”. We’ll go through a series of exercise that are designed to balance these glands. The results can be felt across a wide spectrum, from improvements to digestion to a more balanced emotional state to having a better memory and sleeping better at night. Class 4 (February 25): Beyond Stress: Tapping Into Your Vitality – This class centres around a theme of vitality. We’ll explore the concepts of healthy and unhealthy stress and I’ll introduce you to some exercises designed to help you tap into your inner vitality. Kundalini Yoga as taught by Yogi Bhajan is sometimes called the “mother of all yogas”. A typical class incorporates postures, movement, breathing techniques, meditation and mantra to support enhanced health, focus and connection to purpose. The class begins with the chanting of a short mantra (“Ong Namo, Guru Dev Namo”), a key component in setting the stage for a powerful experience during the class. A set of warm-up exercises is followed by a yoga set, or “kriya”. A kriya is a sequence of exercises that are masterfully woven together to achieve a specific effect. Yogi Bhajan shared hundreds of kriyas, each with a different focus. The kriya is followed by a long, deep relaxation, to integrate the effects of the exercises, and a meditation. There are a wide variety of meditations that make use of various hand positions, or “mudras”. Some meditations are silent and others incorporate the repetitive chanting of a mantra. Most mantras are chanted in Gurmukhi, a language born out of the ancient language of Sanskrit. What makes these mantras special is the effect that is achieved as these words are chanted. It’s something that must be experienced to be appreciated. Words will be provided and, while I encourage you to chant along to get the full impact of the meditation, listening is always an option. Each class concludes with a short prayer and the chanting of “Sat Nam”, a mantra to call upon and acknowledge our inner truth. “Sat” means truth and “Nam” is the naming or calling upon of this truth. I hope that what I’ve shared has given you a good taste of what to expect…and piqued your curiosity. Fundamentally, Kundalini Yoga can’t be explained in words. The only way to learn what it’s all about is to come and experience it for yourself. Attend as many classes as you like. Dress in comfortable clothes and be sure to bring a water bottle. If you’re attending a class at Yoga West for the first time, plan to arrive 15 minutes early to give yourself time to complete a short form and to settle in to the space. If you need a visual reminder, consider printing out this poster and putting it up on your fridge. And why not invite a friend to join you on this new adventure. And you’re very welcome to contact me or Yoga West if you have any questions. 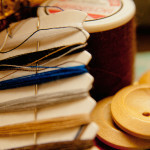 Sutras are words to live by, the threads that string life together. From June 15 to July 16, 2017 I’m teaching a series of classes at Yoga West (2662 West 4th Ave. Vancouver). Each one focuses on one of the five sutras that Yogi Bhajan shared to support us in our current stage of human evolution, the Aquarian Age. You’re very welcome to attend some or all classes, whether you’re brand new to Kundalini Yoga or are a seasoned veteran. You can pay for a drop-in or use your Yoga West class package. Visit Yoga West’s website for more information on class fees. In this time Piscean values are giving way to Aquarian values. The difference between the two is very simple. Piscean values work from the ego, creating boundaries. Aquarian values have no boundaries; they are Infinite. Aquarian consciousness takes you inside your soul, so that you can relate to the soul in all. — Yogi Bhajan from Aquarian Times, Spring 2003. The following is a summary of the themes for each class. Let me know if you have any questions…and I hope to see you at Yoga West! We see others as a reflection of ourselves. 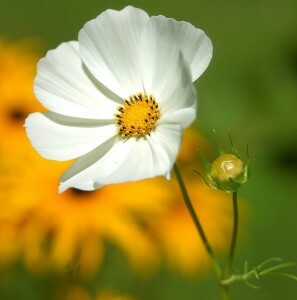 Qualities we admire in others are gifts that we possess. And when we have an adverse reaction to someone we have an opportunity to see our shadow. Come and embrace your light and the shadow it casts. Like it our not, challenges will come along throughout our life. Resisting these challenges can cause us to feel stuck and drained. Embracing them presents us with an opportunity to learn and grow. As children, many of us loved to play with blocks. Bring your inner child and re-experience how much fun blocks can be. Is there anything in your life that you’re putting off? Resisting doing things is, in many cases, more draining that actually doing them. Learn to apply yogic technology to create momentum in your life as you take courageous steps along the path of fulfillment and happiness. One key to thriving in the Aquarian Age is going beyond an intellectual understanding of the world and learning to understand through compassion. Experience yourself as an integral part of life and open yourself to exciting new possibilities. 5th Sutra — Vibrate the Cosmos. The Cosmos shall clear the path. At a basic level we humans (and everything else, for that matter) exist as vibrations. Kundalini Yoga places a strong emphasis on chanting sacred mantras that support us in raising our vibration and reaching heightened levels of awareness. Come and experience it for yourself. I’m looking forward to teaching a series of “Spring Tune-up” Kundalini Yoga classes at Yoga West again this year! Read on for a summary of the series and details on the dates and locations. All classes are at Yoga West (2662 West 4th Avenue, Vancouver) on Sundays from 10-11:30am (specific dates are below). You’re welcome to attend as few or as many classes as you like, and beginners are welcome. Use your Yoga West class package or pay for a drop-in class ($15 for first class, $18 otherwise). Sutras are words to live by, the threads that string life together. This month (June 2015) I’m teaching classes at Yoga West (2662 West 4th Ave. Vancouver) that focus on each of the five sutras that Yogi Bhajan shared to support us in our current stage of human evolution, the Aquarian Age. The following is a summary of the themes for each class. This information is also available on this poster. Let me know if you have any questions…and I hope to see you at Yoga West! I’ll be teaching four “Kundalini Yoga Foundations” classes over the next few months. All classes will be held on Saturdays (May 23, June 13, July 25 and August 29) from 11:45am-1pm at Yoga West, located at 2662 West 4th Avenue in Vancouver. 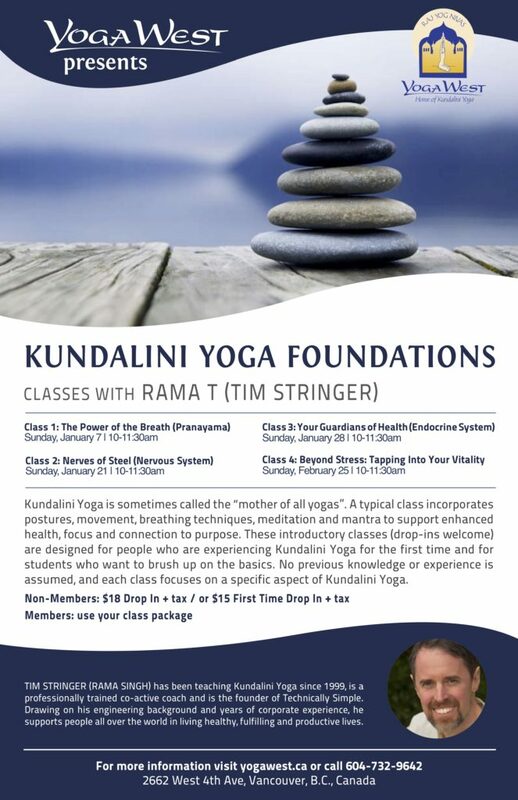 These classes are perfect if you’re practicing Kundalini Yoga for the very first time or want to brush up on the basics. Watch the following video and read on to learn how these classes came to be and for more information on the class format and themes. Twenty years ago I attended my first Kundalini Yoga class. It was taught by my good friend Robert Hay, who enthusiastically promoted the positive benefits of yoga and meditation years before this ancient practice emerged into the mainstream. I remember feeling curious (Robert had been sharing his own experiences with Kundalini Yoga on many occasions, usually after our regular squash games) and admittedly a little sceptical at the prospect of trying something new and decidedly foreign. My sense of adventure in concert with some gentle encouragement from Robert won me over. I showed up for my inaugural class. Inspired by all the benefits and insights that I was realizing through this multi-faced practice, I enrolled in a 200-hour yoga teacher training program in 1999. My primary motivation was to absorb more of this timeless wisdom while delving more deeply into my own personal practice. Much to my surprise, I discovered that I love to teach. I joined the then small, but growing, teaching staff at Rama Lotus, and taught there regularly until moving to Vancouver in 2004. Since completing my certification I’ve the honour of teaching thousands of students at numerous centres across North America, including Yoga West in Vancouver, one of oldest and most respected Kundalini Yoga centres in the world. Over the years I’ve talked to many people who are intrigued by Kundalini Yoga. Some have never practiced yoga, and others have had some experience with other styles, typically those with a primary focus on postures, or “asanas”. Many people I spoke with feel as I did when Robert first invited me to try a class – curious and a little uncomfortable at the prospect of attending their first class surrounded by seasoned yogis who have memorized lengthy mantras and who’s vernacular includes words like “chakra”, “nadis” and “aura”. To make Kundalini Yoga more accessible, I took the initiative to develop classes specifically designed for those of you who are experiencing Kundalini Yoga for the first time. These classes don’t assume any prior experience with any style of yoga. The only requirement is a willingness to try on something new, and to see if it fits. You’re also very welcome to attend if you have had some experience with Kundalini Yoga and would like to get back to basics and fill in some gaps in your knowledge. Class 1 (May 23): The Power of the Breath (Pranayama) — Most of us were never taught to breathe growing up…and likely aren’t breathing as effectively as we could be. During the class we’ll explore a variety of breathing, or pranayama techniques that help us tap into our inner calm as well as some to energize and cleanse the body. Class 2 (June 13): Nerves of Steel (Nervous System) — Yogi Bhajan put a lot of emphasis on the nervous system and gave us a wealth of techniques to help us build this system so that we’re better equipped to handle the stresses of life. I’ll be taking you through some of these techniques during the class and talking about some things you can do in your day-to-day life to help maintain a strong nervous system. Class 3 (July 25): Your Guardians of Health (Endocrine System) — Yogi Bhajan also talked a lot about the endocrine system and collectively referred to these glands as our “guardians of health”. We’ll go through a series of exercise that are designed to balance these glands. The results can be felt across a wide spectrum, from improvements to digestion to a more balanced emotional state to having a better memory and sleeping better at night. Class 4 (August 29): Beyond Stress: Tapping Into Your Vitality – This class centres around a theme of vitality. 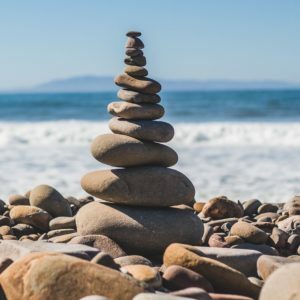 We’ll explore the concepts of healthy and unhealthy stress and I’ll introduce you to some exercises designed to help you tap into your inner vitality.